If I had to choose between meeting Terry Pratchett, Michael Palin and Tim Burton, I would probably shoot myself in the foot with indecision. It wouldn’t be the most constructive decision making tool, but at least it would give me the opportunity to listen to Sad Songs Say So Much whist deciding which Scooby Doo band-aid to apply. However, if it came to choosing one of them to construct a new societal structure for a city, there’d be less literalling up of metaphors, and more moving to Ankh-Morpork. While I could probably tolerate everyone everywhere being Johnny Depp, I’m not super keen on partaking in the annual fish slapping dance or being murdered at the hairdressers. 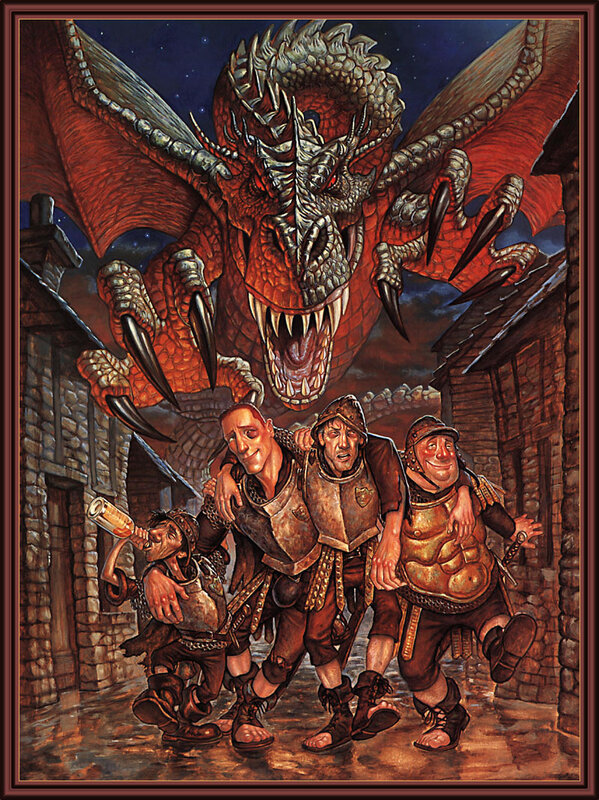 Pratchett’s Discworld series is mostly set in or around the city of Ankh-Morpork. It has a vaguely medieval vibe, features a river that is unsuitable for dumping bodies due to it being an almost-solid and has a university full of wizards. Here, an orangutan is a librarian, a vampire is a photographer, not a sparkly douchebag, and trolls have their own base four numerical system (one, two, three, many, many one, many two, many three, many many). Plus there’s a suitcase with legs. Ankh-Morpork is also a dictatorship, with a guild for almost everything. They run from the conventional types, such as for actors, butchers, fire fighters and musicians, to the less so, including guilds for beggars, alchemists, seamstresses, ‘seamstresses’, dogs, and assassins. Essentially what this means for the community is that crime is legalised and monitored, and, for example, if you pay your annual subscription to the Thieves Guild, you are then safe from robbery for a year. Likewise, murder is all on the up-and-up if you go through the proper channels of the Assassins Guild. Each guild is responsible for policing itself, and individuals muscling in on guild territory without membership are subject to harsh punishment. individual who is either psychotic or childish, and usually ends up assassinated or at the non-child-friendly end of a pointed stick in a revolution. However, for the bulk of the series, this role has been filled by Havelock Vetinari who believes that all people really want is the illusion of control and to be safe in the knowledge that everything tomorrow will be the same as today. So would this be a good place to live? The idea of stability forming the basis of a functional society is nothing new. What this says about a community is quite another. William Golding’s Lord of the Flies suggests that human nature at its essence is wild, narcissistic and antisocial, and that without structure, for most of us (particularly if you are a choir boy for some added 1950s irony) this will eventually take over and lead to pig killing and ultimately the destruction of what little society is left. Conversely, in Brave New World Aldous Huxley suggests that the stability of society is at the expense of free will and thought, with the somewhat grating ‘heroes’ of the book being those who go outside the rules and cause disruption. I’m not quite sure where Ankh-Morpork lies on this spectrum. The citizens certainly aren’t conditioned to fit into certain roles in society, at least no more than us. Even as a dictatorship, the citizens are as autonomous as we are – except they are surrounded by trolls, wizards and Mrs Cake. The main difference I think comes from the guild system. At first glance, it seems like a pretty good idea and also provides an opportunity for some dubious mathematics. Legalising and regulating crime = more control, which surely = win? But what would happen in a city where theft is based on whether you pay an annual subscription or not? While my grasp of economics goes about as far as the Sam Vimes “Boots” Theory of Economic Injustice, surely this would lead to a situation where the people getting robbed would be those who couldn’t afford to pay an annual fee and thus be the most affected by robberies and muggings. Similarly, if assassination is all well and good (for the right fee), surely business rivals would be rapidly bumped off, as well as people standing in the way of inheritances, personal gain and possibly oversensitive wretches who don’t like lining up to catch the bus. Over a few generations, this could lead to a society purely made up of murderous cut-throat scoundrels, who I mostly picture leering whilst wearing monocles and trench coats. At least in our society, positions are more who and what you know, rather than who you kill. Mostly. Then there’s the extra crime committed by guilds to punish those acting outside the constraints of guild rules. All of which is condoned by the Patrician. Good times. If Ankh-Morpork existed in the way it does in the books, I think living there would probably be ok. Hey, you could witness awesome things like space/time anomalies in a library or use baked goods during warfare. However a few generations down the line, when Vetinari is no longer in charge, I don’t think I would feel comfortable in the company of citizens more statistically skewed towards those willing to chop off the hands of thieves acting outside the guild, or have people killed. Partly because of the ethics, but mostly because of the monocles. There would metaphorically be nothing but the glom of nit. This entry was posted in Books, Generally Geeky and tagged Ankh-Morpork, Discworld, discworld series, Havelock Vetinari, Patrician, Sam Vimes, Society, Terry Pratchett. Bookmark the permalink. 2 Responses to ANKH-MORPORK: COMMUNITY, IDENTITY, STABILITY. I’d be pretty shocked if Vetinari didn’t have a plan in place in the event of his demise. What that plan might be, I couldn’t really guess at– will he have a vampire turn him? Eventual zombification? Or just a really intricate set of instructions for Drumknott/Vimes/Carrot/whoever else? But you know he’s thought about it. This is the one thing I’d ask Pterry about, if I could.